As a young fashion illustrator in 1970, I had a mentor who spoke to me of (Chi). She said it was: “becoming one with the brush”. Without computers or the option of “Google” I accepted this definition. She also told me that it would take about six (6) months and that seemed an eternity to me as a 20 year old. Some 40 years later, after learning that life is a journey, I look back to see the real meaning of (chi) as life force; the breath of God and, with great joy, I say that to me Art, as in many of life’s disciplines, is being open to and walking in the “life force” is the process and the end product. The first thing that popped up on my “Google” search is chi/KT/noun: the twenty-second letter of the Greek alphabet, translated in the traditional Latin style as ‘ch’ (as in Christ). The next step in my artistic journey, after my black and white fashion illustration and chi awareness of the brush, was a saturation of work in color theory. The Munsell color theory stresses intensity or (light and dark), hue (the actual colors), and Chroma or (saturation). I mixed acrylic paints in baby food jars and worked on large canvases. The watercolor journey began in the 1970-80’s era under my mentor, Robert “Bob” Mills. He was, at that time, the Art Director of RL Bryan Printing Company in Columbia, SC where I was employed as a staff artist, designer. He would do illustrations for magazine covers and I became fascinated with the medium. In exploring watercolor, I fell in love with another substrait other than canvas and began my love affair with “paper” as I watched the water medium respond to the surface, weather hot or cold pressed hand made paper. It was at this point in my personal life that I began to travel and watercolor was portable and traveled well with me wherever I moved. In my early stages in SC I worked with and exhibited with the fledgling SC Watercolor Society and showed in the 1st annual Juried show in 1977 in Greenville, SC. In the 1980’s I painted in seminars taught by Tony Couch after which I was selected to exhibit at the National “Aqueous Open” exhibit. In the 1990’s moving to Roanoke, VA I developed further with a year of studio work and immersed myself in “Plein – Air” (outdoor) painting and created the first of many interior studio paintings “Iris – Three in One”, that bring the outside in and the inside out when set against windows. 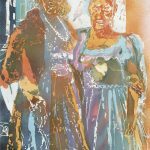 I995 – early 2000’s , while in Florida, I have been a charter member of the Florida Chapter of Women in the Arts and exhibited at a special juried Exhibit held at Orland Museum of Art. I have volunteered my time abroad with children in Namibia Africa working with them at the “Talitha-Kumi” Christian Academy. In the U.S. I have volunteered in helping U.S. children at Thornwell Home for Children gain exposure to the Graphic Arts Field with a tour to “Lark Books” in Ashville , NC. And, worked with students, children and adults at the Lake Helen Community Center. I was privileged to visit the Etosha Game Preserve in Namibia and came back to produce the recent animal watercolors.